We developed and have used our custom-made equipment since 2000. It has been tested every day, 5 days a week. Our routine? • First we drive to a scheduled facility in our 16’ box truck. It holds 3 people and fits into a regular parking space. • Then we unload 2 operatories of equipment, roll it into a facility, and set up the dental clinic. This takes about 20 minutes. • ADEC chairs on custom bases. 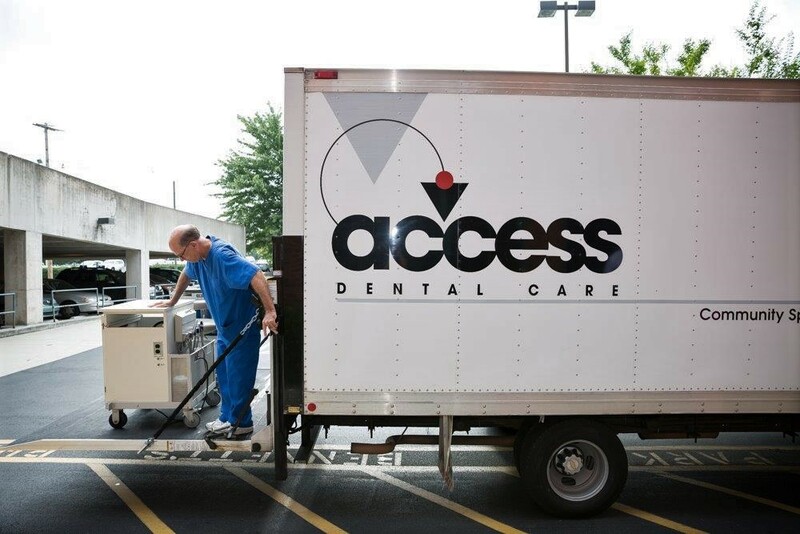 Heavy duty cart frameworks and casters make moving a breeze, while the dental chairs make our set-up look like a “real” dental office. At the end of the day all instruments are autoclaved, supplies restocked, and we are ready for another day. Patient information has been entered throughout the day and transferred to the office for same day billing and next visit scheduling. 1. Each truck team serves 25-30 facilities within a 1.5 hour driving radius. All dental team members drive the truck. 2. Special Care Dentistry needs to be done within a facility. Transporting medically compromised to a van in the parking lot on a rainy winter day – does that make sense? 3. This delivery system cost less than half of a van. No broken pipes in the winter. No gray water and special electrical hook-ups. No special drivers to transport the unit. No excessive gas bills. 4. All the equipment is serviced by Patterson Dental either at the office or facility. It’s all standard equipment. Don't just take our work for it! Check out some of the programs using our equipment. Interested in purchasing or have more questions?